We get more questions about this favorite cut than anything else! So what is a cottage ham anyway? A cottage ham is a boneless pork shoulder that has been cured and smoked. They are typically 2-3 lbs in size. First, we bone out the pork shoulder, then place it in a brine. A brine is a curing solution. We cure our cottage hams for 3 days. 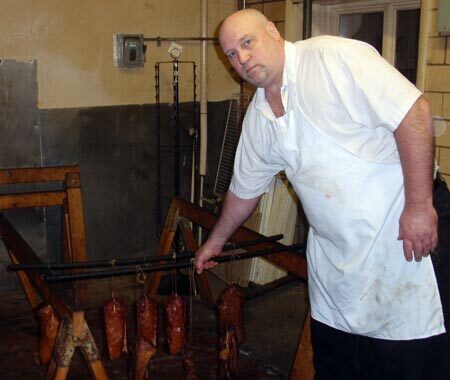 Once they are removed from the brine, they are placed in the smokehouse. 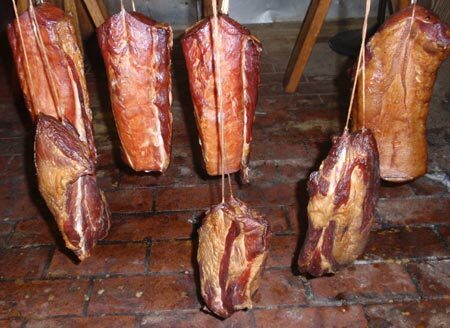 Here they hang for half a day and take in all that smoky goodness. Once meats are smoked, they will keep for several weeks in the refrigerator. Cottage hams can be boiled with vegetables, or just heated and sliced. Everyone loves cottage hams!